It is strange for a film called Ghost to not be scary. This isn’t Poltergeist and isn’t trying to terrify. Instead this is a supernatural romance story and one which relies heavily on it’s two leads and luckily for this movie, the leads are electric with chemistry and likability. Patrick Swayze and Demi Moore seem made for this role. They are believable as a couple and work well with their love scenes, confrontations and playful moments. It is an effective pairing and it makes the moments to come even more impactful. This is a movie about a ghost so it of course needs a death. This is where the film is ramped up a gear and Swayze comes into his own. The scene in which he is murdered and the realisation that he is actually dead is done very well and it is refreshing to see a film about death that doesn’t play on fear or get too sentimental. There is a good mythology around the act of dying in this movie. The “rules” are explained well and the idea that Swayze is trying his hardest to communicate with Moore and getting nowhere makes for infuriating but compelling viewing. The moments in which Swayze is learning about being a ghost are the best of the movie and although Ghost is clearly not a horror, one particular scene involving a train-carriage and another ghost will send chills to anyone. The ace up the sleeve of the movie is a different character entirely though. Whoopi Goldberg lends comedy class to any movie she intends to and here is no different. Her clairvoyant is fantastic and the highlight of the film. 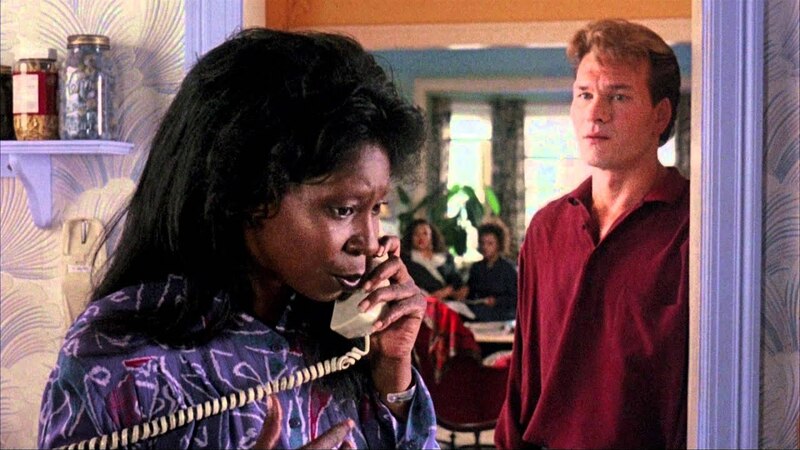 A different kind of chemistry is developed between her character and Swayze and it makes for some of the better moments of the movie, certainly the funniest at least. It also helps the sub-plot of the murder to develop too. What could be a grim and darker plot involving betrayal and even attempts to seduce Moore are lightened by Goldberg’s involvement and the interplay between her and Swayze. This story also builds to a “fist-pumping” conclusion that satisfies. Which is why it is also disappointing when the central romance story doesn’t try anything radically different. When stripped away it is still just a romance and the tale of rekindled love. The finale is cool but the underlying tale is not that original once you get past the novelty of Swayze becoming a ghost. Add to this the predictability of how the story ends and you lose the spark the movie starts with. 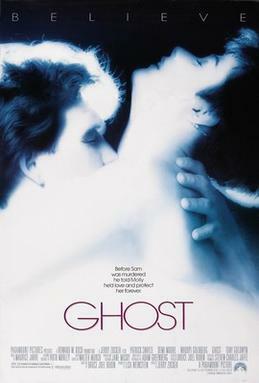 Overall, Ghost is an impressive and original way to tell a worn romantic story. It had two great leads and a fantastic support from an always funny Whoopi Goldberg. The central ideas are very cool but eventually the worn concept underneath starts to seep through.